Amir: "Classic, classic drum break. 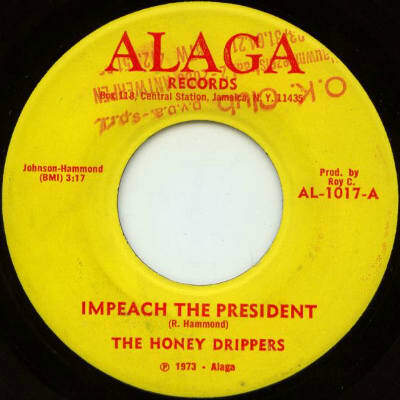 I&apos;m sure The Honeydrippers didn&apos;t make it to be like that, but it just so happened that some hip-hop cats were like, &apos;This is ill, I need to be able to use it.&apos; In the late &apos;80s, every song had either James Brown, &apos;Impeach The President,&apos; or Melvin Bliss &apos;Synthetic Substitution,&apos; then after that the Skull Snaps. Kon: "Another classic break that has been sampled a million times. I think to this day, the best use of that break has to be &apos;Do the James&apos; by Super Lover Cee & Casanova Rud, produced by Paul C who was tragically shot and killed back in the day. He&apos;s the guy who kinda taught Large Professor and a lot of the Queens guys how to get busy in the studio. A crazy break."